When you retire, you need to decide how we’ll pay out your retirement benefit. 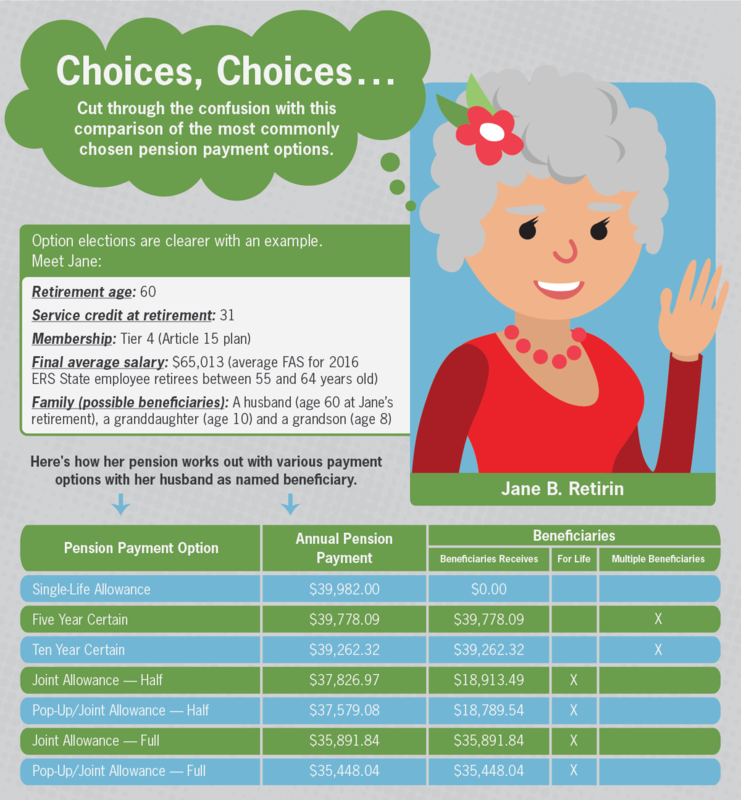 You do that by choosing a pension payment option. Each payment option provides you with a monthly benefit for life. Nine of our payment options let you receive a smaller benefit so you can provide for a beneficiary when you die. There is also an option that pays you the largest amount of your benefit, but pays nothing to a beneficiary. Read the full descriptions of our payment options on our website. Do you want a payment made to one or more beneficiaries after your death? 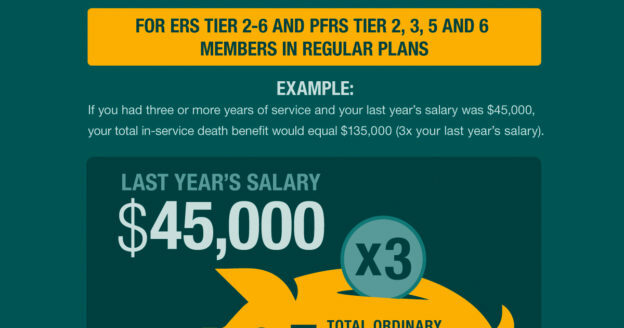 Do you know about your beneficiary’s future income in retirement? Will your beneficiary receive their own pension? How much will they receive from Social Security benefits or other retirement savings accounts? Do you have life insurance coverage? Life insurance payments could help your beneficiary make ends meet. What are your financial obligations? 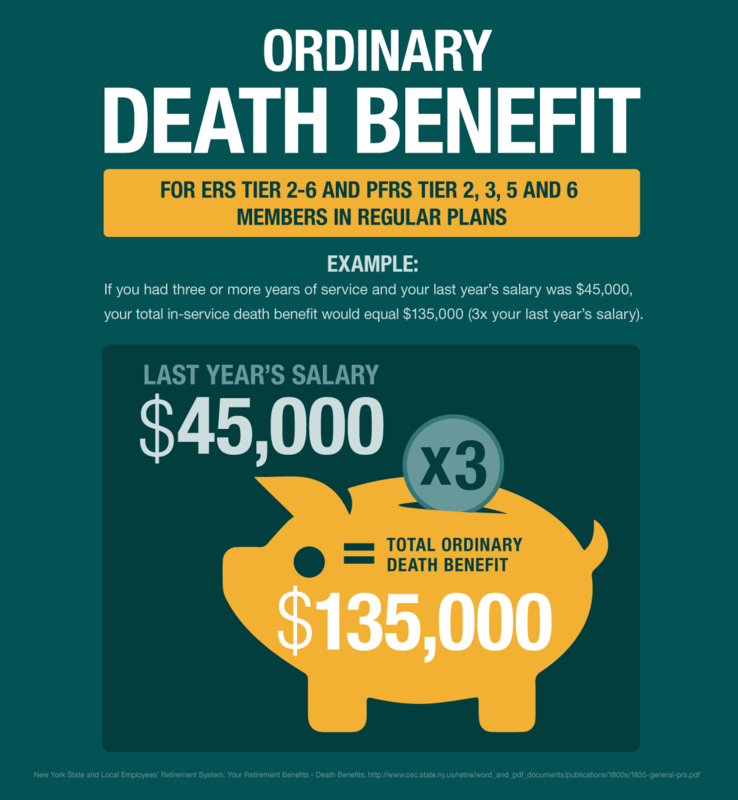 Will your beneficiary have enough income to cover expenses if you die? The answers to these questions can help you decide which option meets your needs. If you have any questions, email us from our website. Would you like to read more NYSLRS Basics posts? 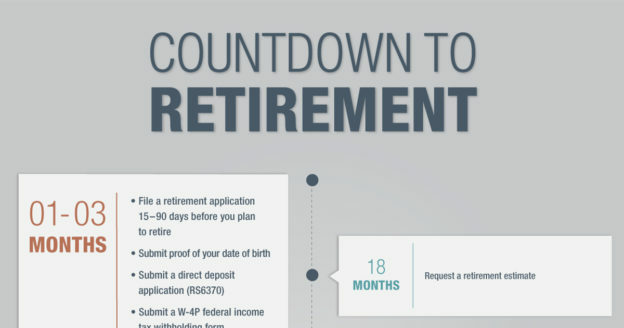 Check out our earlier post on when you can retire. Content last revised November 25, 2015. This entry was posted in General News, Members and tagged beneficiary, benefits, defined benefit plan, ERS, FAS, Final average salary, Information is the Key, know your benefits, members, New York State & Local Retirement System, NYSLRS, NYSLRS Basics, Payment Option, pension payment option, PFRS, Preparing to Retire, retirement, retirement plan, retirement planning on November 25, 2015 by NYSLRS. After you retire, we start calculating the amount of your final retirement benefit. 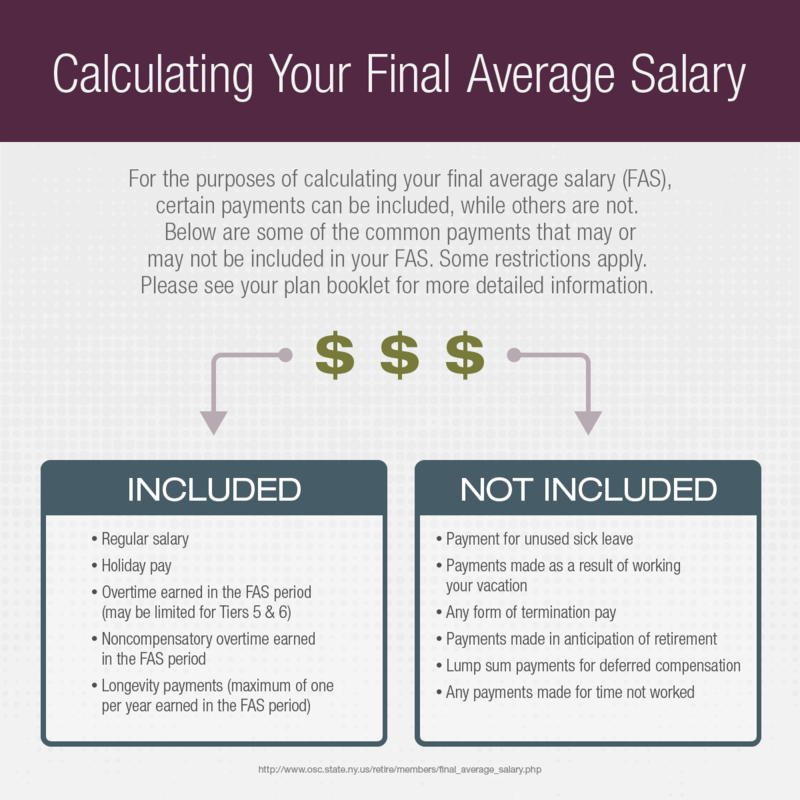 This means you won’t receive your full pension payment right away. It often takes time for your former employer to provide us the specific information we need to determine your final retirement benefit, such as your employer’s certification of your unused vacation and sick leave credits. So, for the first few months of your retirement, your first payments will be advance payments. 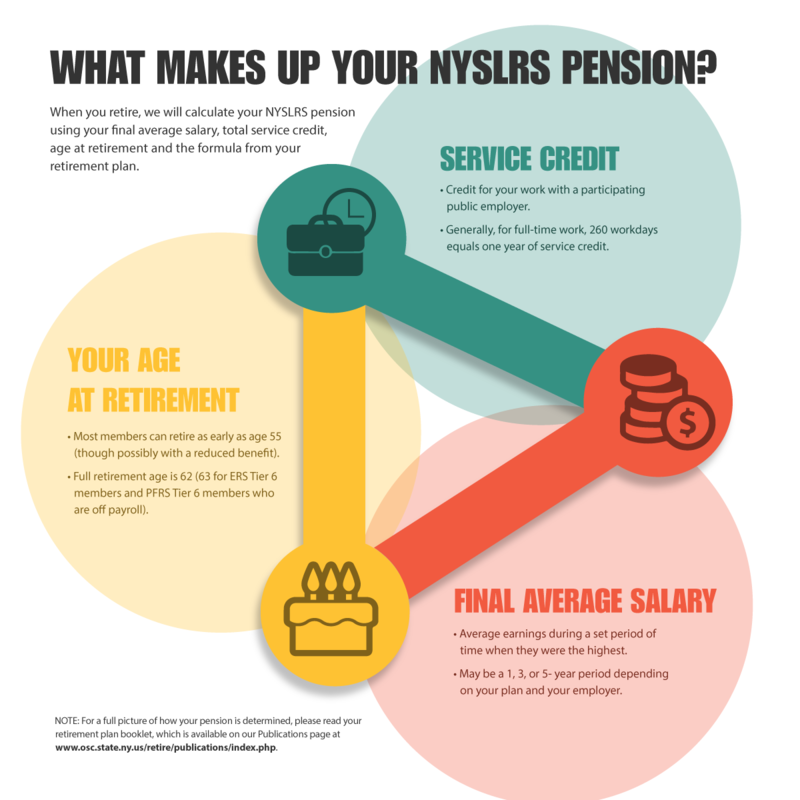 Advance payments are based on your most recent NYSLRS retirement estimate. They provide up to 95 percent of the retirement option you elected. You’ll continue to receive advance payments until we finalize your benefit. Currently, our pension calculations can take up to five months to complete, though every case is different; if we requested more information from you or your employer, it may lengthen the amount of time it takes to complete your retirement case. Advance payments are always paid via check and are mailed to the address we have on file for you. Make sure we have the correct address for you when you retire. When Can I Expect My First Advance Payment? 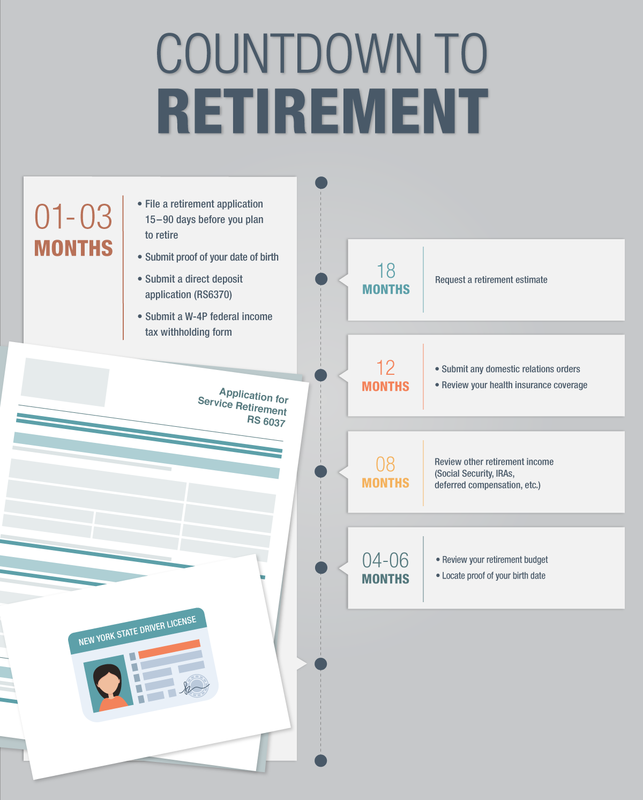 The month you retire determines when advance payments would start. 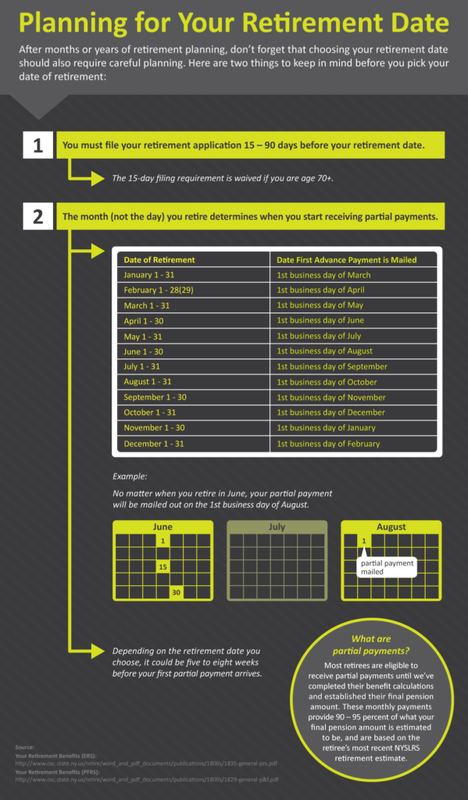 The table below shows the schedule of mailing days for a new retiree’s first advance payment. 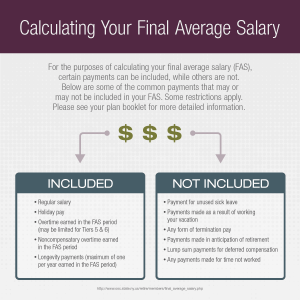 What Happens Once My Pension is Finalized? Once your monthly pension is finalized, we’ll send you a retroactive payment to make up the difference between the advance payments you’ve received and the amount actually due (minus federal withholding). You’ll also receive a letter explaining how we calculated your final retirement benefit, and what your final monthly benefit will be for life. Once you receive your retroactive payment, you’re officially part of the regular pension disbursement schedule. If you signed up for direct deposit, your monthly pension payment will be deposited directly into your bank account on the last business day of the month. If you didn’t sign up for direct deposit, you’ll receive a pension check, which is mailed out on the second-to-last business day of the month. If you have questions about what to expect once you retire, check out our Life Changes: A Guide for Retirees publication, or contact us. Content last revised December 17, 2014. This entry was posted in General News, Members, NYSLRS Retirees, Retirees and tagged benefits, ERS, members, New York State & Local Retirement System, NYSLRS, pension payment option, PFRS, retirement on December 17, 2014 by NYSLRS.